Its been awhile since we’ve done a Tumblr digest, we featured one many months ago before Season 2 had started, though sadly many featured have retired (Pinkamenia, Berry Pnuch, etc), so I figured its about time to crank that old spotlight over and feature the more recent ones. If you’ve never wandered the wasteland of the Ask-Tumblr realm, there is a ton with various degrees of artwork (ranging from basic to awesome). Thankfully there’s a few people who keep track of these, such as this list kept up to date on google docs. We also feature our own link folder on the left (bottom) that includes a ton. Ask Jappleack probably needs no introduction as its gained a major following. You might reconize the artwork after a few minutes, as this tumblr is ran by Max Gilardi, creator of APPLE.MOV (I think now the top viewed pony video to date). 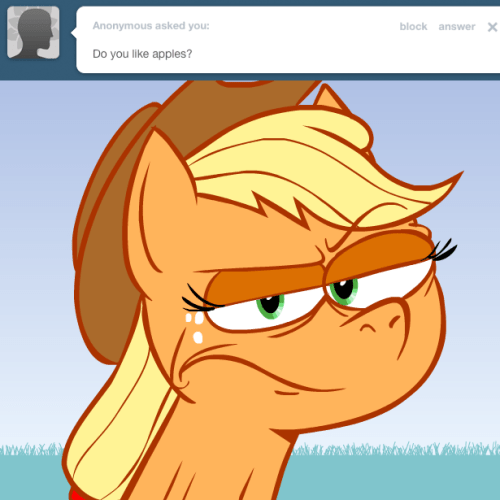 It follows the questioning of Jappleack, the character from the short film as people question her about apples, the family and of course the usual tumblr questions. The artwork is supreme and on par with its youtube counterpart. Its updates Wednesdays and Sundays, though it seems to be updated even more frequently. I do tag this tumblr with a [NSFW] due to the swearing, but outside of foul language there’s nothing else to worry about. In the more recent post, Jappleack has hinted at something big coming, including a 20 second animated video (just shows Jappleack sleeping, only to be woken by something huge walking by). Many are assuming its going to be a follow up flick to APPLE.MOV. Warning! 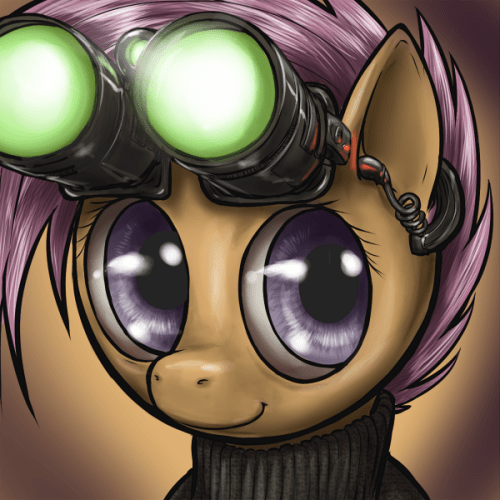 A lead vest is required to view this tumblr as the cuteness levels are at Chernobyl levels. As My Little Chubbies is another recent addition to the world of ask blogs, and features chubby blob versions of our favorite ponies. I know this tumblr has spread like wild fire and much like Jappleack, probably needs very little introduction. 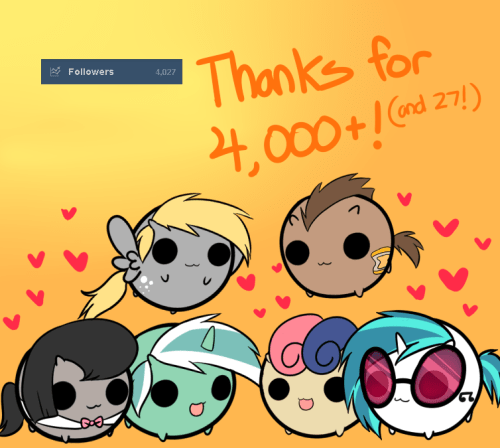 It follows the chubby versions of our ponies as people ask them questions about their lives as tiny little creatures. There’s been so much love for this tumblr that it has spawned the creator, PhantomDarkLover to produce plushies at one point of the characters, and includes its own version of Desktop Ponies (Desktop Chubbies). This tumblr is totally [SFW]. There is no update schedule but it seems to be new entries just about daily. Last for Digest 02 is Ask Stalkerloo, following the exploits of Scootloo as she stalks various ponies of ponyville (especially Rainbow Dash of course). This is the most recent one I began to follow, its pretty SFW as there has yet been anything extreme outside your usual stalker type activities (spying, collecting hair), and the artwork is to the die for. This tumblr has just started out but is gaining a lot of followers. Seems announced on the 21st there is a collaborative project being conducted that is going to turn the random tumblr (or possibly setup in another account) into episodes. Stalkerloo Episode One has been given the synopsis of “Rainbow Dash’s patience is tested when she finally confronts Scootaloo about following her around so much, and in turn learns something about herself, forgiveness and friendship.” Its said to be somewhat of an experiment, and if it goes good there will be followup episodes. Truthfully I will probably feature this on DHN when it comes out. And that is it for this edition of our tumblr digest. If you know of some good tumblrs that should be featured, let me know so I can check them out. BTW The Cutie Pox TrollHD is out.